(FT) -- Iraq is on course to overtake Iran as the holder of the world's second-largest proven oil reserves, solidifying its position as the energy industry's new frontier in the scramble to secure fresh resources. Baghdad agreed on Friday to deals with Royal Dutch Shell and China's CNPC for two large oilfields, following on from similar accords with ExxonMobil, Eni and BP . On Saturday, Lukoil sealed a deal on the West Qurna field. Consultants who have analysed the agreements struck by Baghdad said the contracts underlined the companies' confidence that they would be able to use modern seismic and drilling technology to get far more oil out of the fields than had previously been thought possible. Iraq's proven reserves now stand at 115bn barrels, below Iran's 137bn and Saudi Arabia's record 264bn. But Iraq's reserves data dates from the 1970s, before the improvements in technology that transformed the industry. 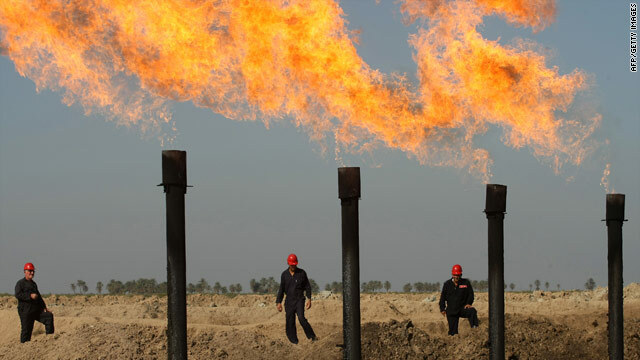 Raad Alkadiri, an Iraq expert at PFC Energy in Washington, said the companies offered Iraq very good terms in the deals because they believed that the oilfields held more recoverable oil than was commonly assumed. A second consultant, Falah al-Khawaja, who spent 41 years working in Iraq's oil sector before becoming an independent consultant, calculated on the basis of the bids that Iraq would overtake Iran in proven reserves in three years. "These are not small companies. They have been studying Iraq for some time," he said. Mr Alkadiri warned that the resurgence of Iraq as a significant oil producer would cause problems within Opec, as the oil cartel would eventually have to reduce the production quotas of many of its members to accommodate Iraq. Iraq's quota has not been enforced since UN imposed sanctions in the early 1990s. However, if Iraq's reserves rise, Opec's gentleman's agreement that sees Iraq's quota not exceeding that of Iran will come under pressure to be changed. "The Iraqis are making it clear that they no longer see themselves in parity with Iran. They are eyeing themselves being potentially on par with Saudi Arabia," Mr Alkadiri said. On Saturday, Hussein Shahristani, Iraq's oil minister, took a diplomatic tone saying: "Iraq is a very active member of Opec. We will be coordinating with its effort to make sure Iraq and all other countries can maximise the revenues from oil sales." However oil company executives and other Iraqi officials believe Iraq will do well to be able to pump 7m-10m barrels a day within the next seven to 10 years. But before that occurs, much still has to happen, including the ratification of these latest deals by the Iraqi cabinet, the repair of civil infrastructure, such as roads bridges and hospital and the revamping of ports, pipelines and other oil facilities critical to allowing any new oil pumped by international oil companies to be exported. Iraq's general elections in March will also be a critical milestone in the development of the fields because a new government could either be friendly or hostile to Iraq opening up its most important industry to foreigners. Iraq's oil auction saw Royal Dutch Shell and Malaysia's Petronas win the right to develop Iraq's giant Majnoon field after they promised to boost its production to 1.8m barrels a day from just 46,000 b/d today. The deal's terms suggested that Iraq pays $1.39 for each incremental barrel of oil -- a very low fee that reflected the fierce level of competition, analysts said. The latest deal of the auction came on Saturday with Lukoil of Russia winning the rights to develop Iraq's giant West Qurna field, which the company has been lobbying to be able to work on since the time of Saddam Hussein. The partners in the development will be Total and Petronas. The group said it would accept a remuneration fee of $1.15 a barrel and projected a plateau production target of 1.8m barrels a day. The two-day auction was deemed an overall success for Iraq because it managed to garner good financial terms for its biggest fields. But the auction also showed that oil companies were not willing to compete for deals to develop Iraq's smaller fields and those in more dangerous locations. These latest awards come in addition to three big agreements Iraq has made with ExxonMobil, Eni and BP. In total oil companies have now pledged to boost within the decade Iraq's production by 7.3m b/d to nearly 10m b/d, more than Saudi Arabia produces today.